SFU President and Vice-Chancellor Andrew Petter, SFU Chancellor Anne Giardini and UBC President Santo Ono congratulate His Highness the Aga Khan on receipt of honorary degrees from both universities. 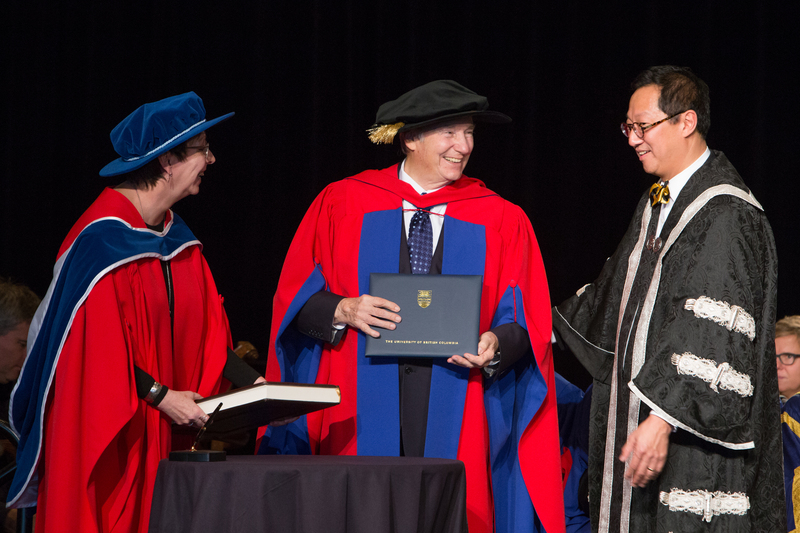 UBC Registrar Kate Ross and UBC President and Vice-Chancellor Santa Ono share a light moment with His Highness the Aga Khan upon conferral of degree of Doctor of Laws, Honoris Causa. 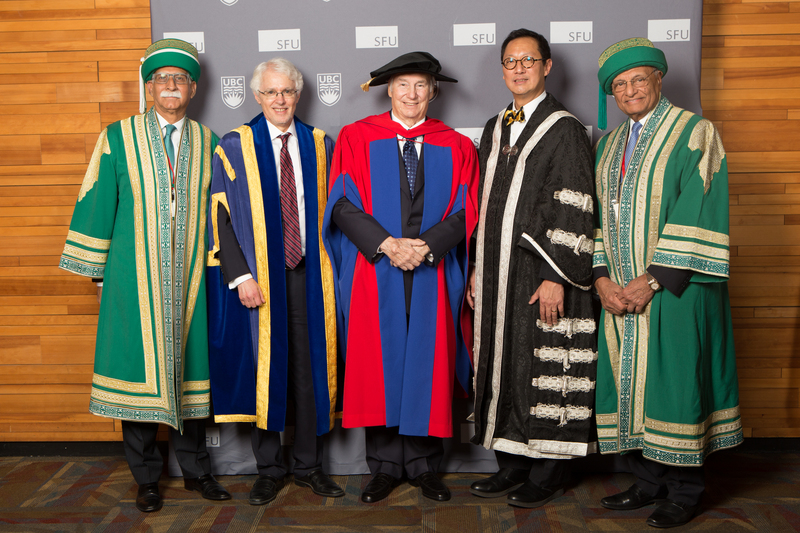 AKU President Firoz Rasul, SFU President and Vice-Chancellor Andrew Petter, His Highness the Aga Khan, UBC President and Vice-Chancellor and AKU Board of trustees Chairman Shams Kassim-Lakha pose for a post-ceremony picture. 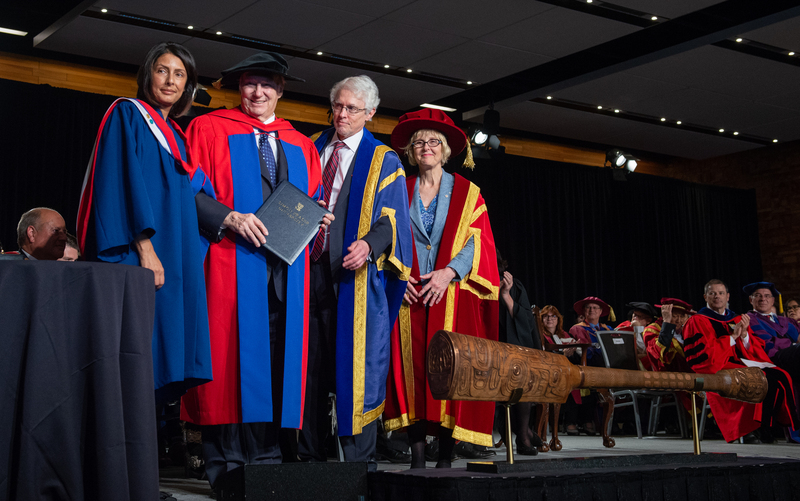 SFU Registrar Rummana Khan Hemani, SFU President and Vice Chancellor Andrew Petter and SFU Chancellor Anne Giardini pose with His Highness the Aga Khan on conferral of degree of Doctor of Laws, Honoris Causa. Reading from the citation presented to the Aga Khan, UBC President and Vice-Chancellor Santa Ono noted “… I can think of no candidate who so deserves this unprecedented joint recognition than His Highness the Aga Khan.” Citing that there is no “better exemplar than His Highness the Aga Khan” President Ono applauded the Aga Khan’s leadership and spoke of the deep impact that the AKDN has had around the world investing close to $1 billion annually in non-profit development activities. Acknowledging that the AKDN is “guided by the ethical principles of Islam”, President Ono stressed that it works “with every religion, race, ethnicity and gender” and that “pluralism is a central pillar of the AKDN’s ethical framework.” “We are, again, inspired by this example” said Ono. Echoing these sentiments, Andrew Petter, SFU President and Vice-Chancellor, reflected on the symmetry of values and common objectives of His Highness the Aga Khan and SFU noting that both are “committed to the values of education, pluralism and global citizenship” as well as the “value of community engagement” as “drivers of social betterment.” Offering examples of AKDN’s embrace of such ideology, President Petter highlighted AKDN’s contributions in the fields of education, health, civil society, humanitarian assistance, social infrastructure, and culture. The recent inauguration of the Aga Khan Garden, Alberta earlier in the week exemplifies one of the “extraordinary cultural legacies of Muslim civilisations” that His Highness has brought to Canada. The unique distinction of today’s conferrals adds to an illustrious list of Canadian honours bestowed upon the Aga Khan. 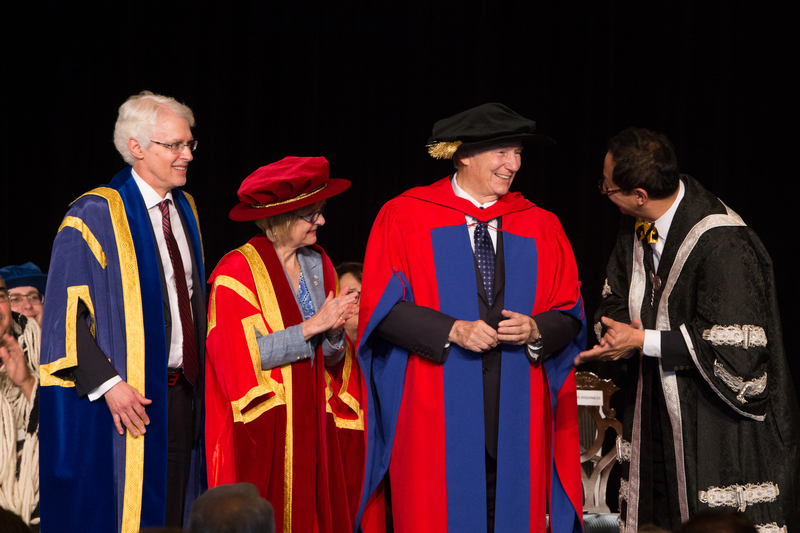 Earlier in his visit to Canada, His Highness was conferred a Doctor of Laws, honoris causa, from the University of Calgary in recognition of his exceptional service to humanity and his “impact and spirit” which was said to be “felt by millions of people” around the world. His Highness is also a past recipient of honorary degrees from the University of Alberta, the University of Toronto, McMaster University, University of Ottawa, and McGill University. He was invested as honorary companion of the Order of Canada and an honorary Canadian citizen. In 2014, the Aga Khan became the first faith leader to address both houses of the Parliament of Canada. These awards, while serving as symbolic representations of the admiration and reverence of the Aga Khan and his work, are also illustrative of the friendship and partnership between the Ismaili Imamat (Office of the Imam) and Canadian institutions.